Learn how to seamlessly move a JPEG image from Adobe Lightroom over to Photoshop for further editing. Then learn how to move the edited version back to Lightroom when you're done! For Lightroom CC and Photoshop CC. As we learned in the previous tutorial on how to move raw files between Lightroom and Photoshop, Lightroom is primarily a raw image processor, meaning it was designed for improving and enhancing the look of photos that were captured and saved by your camera in the raw file format. Yet Lightroom can also be used just as easily with non-raw files such as JPEG, TIFF and Photoshop's own PSD format. Even though raw files have serious advantages over JPEGs (check out our Raw vs JPEG For Photo Editing tutorial for more details), JPEG remains the most popular and widely-used format for capturing and storing photographic images. In this tutorial, we'll learn how to move JPEG files between Lightroom and Photoshop, but everything we'll cover also applies to TIFFs and PSDs. This is lesson 9 of 10 in Chapter 2 - Opening Images into Photoshop. Let's get started! 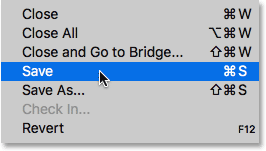 A JPEG file open in Lightroom's Develop module. The overall photo is nice enough, but the wires along the top are a problem. The bar above the Filmstrip shows the file name and extension. I'd like to remove those wires, but I can't do that in Lightroom. That's because, as we learned in the previous tutorial, Adobe Lightroom is not a pixel editor. 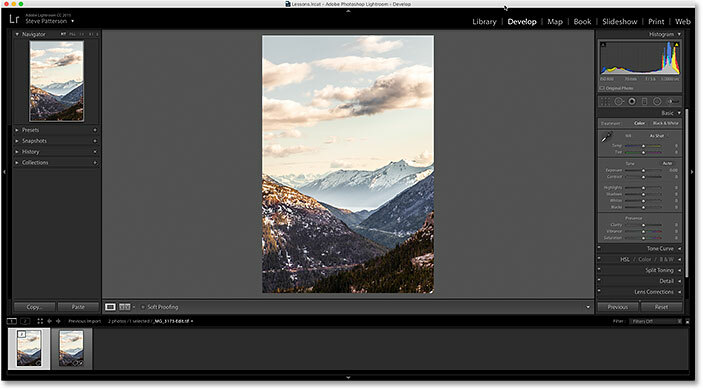 Rather than changing the pixels in an image, Lightroom works by storing instructions on how to improve and enhance the photo's appearance, and what it shows us on the screen is simply a preview of what the image would look like with those instructions applied. It doesn't actually apply our changes until we go to export the photo later, either for the web, print, or as we'll see, when passing the image over to Photoshop. Even then, Lightroom does not apply our changes to the original photo. Instead, it creates a copy of the image when we go to export it and applies our changes to the copy. The original photo is never harmed. 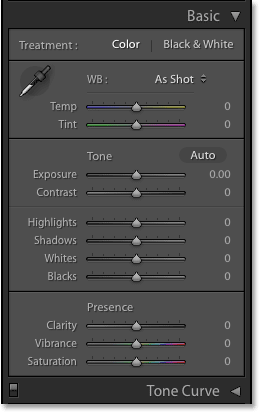 The advantage to the way Lightroom works is that everything we do is entirely non-destructive. We can make as many changes as we like without affecting the original image at all. Using Lightroom's simple and intuitive sliders, we can easily fix any overall exposure, contrast or color problems, and bring out hidden detail in the shadows and highlights. We can add some initial sharpening to the image, fix lens distortion issues, and even add some basic effects, like split toning or vignetting. There's lots that Lightroom can do. Yet there's lots that Lightroom can not do. That's because there's only so much we can do without changing the pixels in the image. If I want to remove those wires, for example, I'll need to edit the pixels. Lightroom can't do it, but Photoshop definitely can. Photoshop's pixel-editing power is unmatched, and once we learn to use Lightroom and Photoshop together as a team, taking advantage of each program's unique strengths, then there's really nothing we can't do with our images. The general rule in a good Lightroom/Photoshop workflow is to make as many improvements to the image as we can in Lightroom. 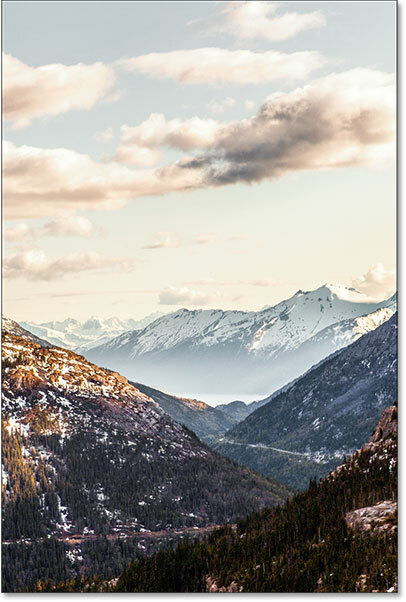 In many cases, you'll find that Lightroom is all you need. But if you've done all you can in Lightroom and the image still needs further editing, like my issue here with the hydro wires, then it's time to pass the image over to Photoshop. 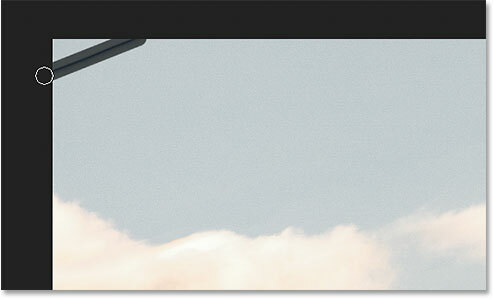 The Basic panel in Lightroom is where we make most of our image adjustments. I've also added some initial sharpening in the Detail panel and fixed some lens distortion in the Lens Corrections panel. There really isn't much more that needs to be done with this image in Lightroom, so I'm ready to move it over to Photoshop. In Lightroom, go to Photo > Edit In > Edit in Adobe Photoshop. Choosing "Edit a Copy with Lightroom Adjustments". The image has been moved to Photoshop, complete with the adjustments made in Lightroom. Selecting the Spot Healing Brush Tool. 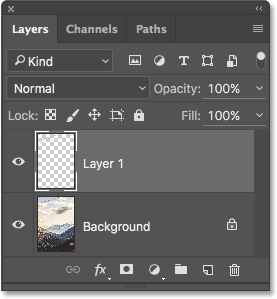 Choosing "Content-Aware" and "Sample All Layers" in the Options Bar. Making my brush size slightly wider than the area I want to remove. When removing long, straight sections such as wires, click at one end, then Shift-click at the other end. Photoshop was able to quickly remove the first wire from the photo. Painting over the second wire by clicking at one end, then Shift-clicking at the other. Removing the section of wire I missed with the first pass. Removing the final wire from the upper left corner. The hydro wires were no match for Photoshop. However, while it looks like the same image, if we look down in the Filmstrip, we see that I now actually have two versions of the image; one is the original, the other is the version I edited in Photoshop. 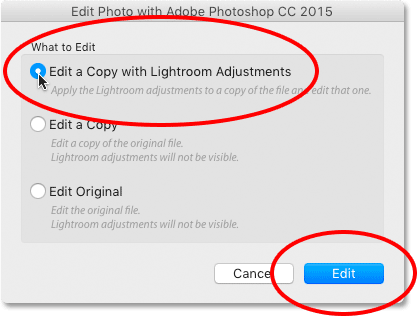 That's because back when we sent the file over to Photoshop, we chose the "Edit a Copy with Lightroom Adjustments" option which told Lightroom to send Photoshop a copy of the image, not the original. The copy, which contains our Photoshop edits, has now been returned to Lightroom and added to its catalog along with the original. The Photoshopped version was saved as a TIFF file with "-Edit" added to its name. All of the sliders in the Basic panel have been reset to zero. Going once again to Photo > Edit In > Edit in Adobe Photoshop. 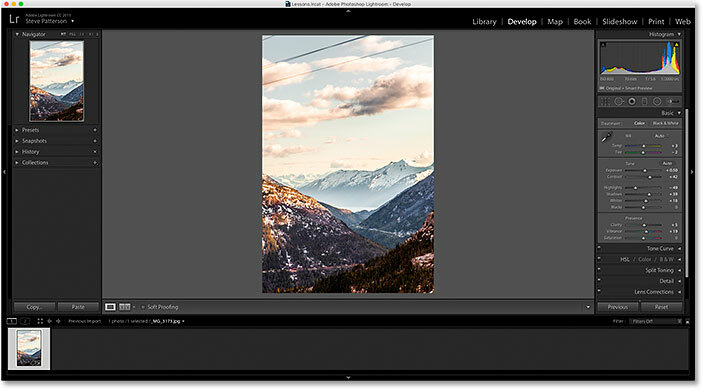 Lightroom will again ask what it is exactly that you want to send over to Photoshop. This time, we don't need another copy of the image. We want to open the exact same file that we worked on previously in Photoshop. 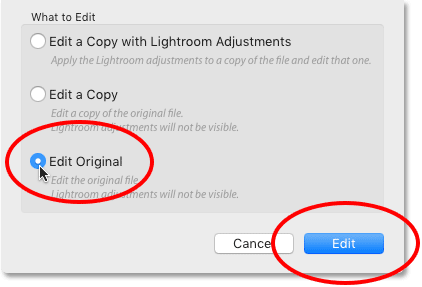 Since the first two options ("Edit a Copy with Lightroom Adjustments" and "Edit a Copy") will both make another copy of the image, they're not the options we want. Instead, we want to choose the third option, Edit Original. If you do want to create another copy of the image at this point (maybe for experimenting with an idea), don't choose "Edit a Copy with Lightroom Adjustments" like we did originally. The reason is that this option will flatten your image when it opens in Photoshop, so any layers you added previously will be gone. Instead, choose the second option, Edit a Copy. This will send a new copy of the file over to Photoshop with all of your layers intact. The only other important thing to note here is that if you’ve made any additional adjustments to the image in Lightroom since the last time you saved it in Photoshop, choosing either “Edit Original” or “Edit a Copy” will not pass those adjustments over to Photoshop. Instead, you’ll see the image in Photoshop as it appeared before those Lightroom adjustments were made. However, it’s only temporary. As soon as you return to Lightroom, the missing adjustments will reappear. Choose "Edit Original" to work on the same file as before in Photoshop. The previously-edited file is back in Photoshop. The document tab shows us which image we opened from Lightroom. 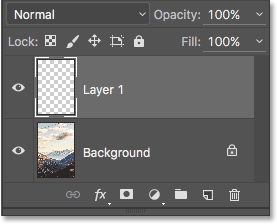 The Layers panel showing the layer ("Layer 1") I added previously in Photoshop. When you're done with your latest round of Photoshop edits, save the file the same way you did before by going up to the File menu and choosing Save. Then, close the file by going back up to the File menu and choosing Close. Return to Lightroom, where you'll see your image updated with your latest changes. And there we have it! 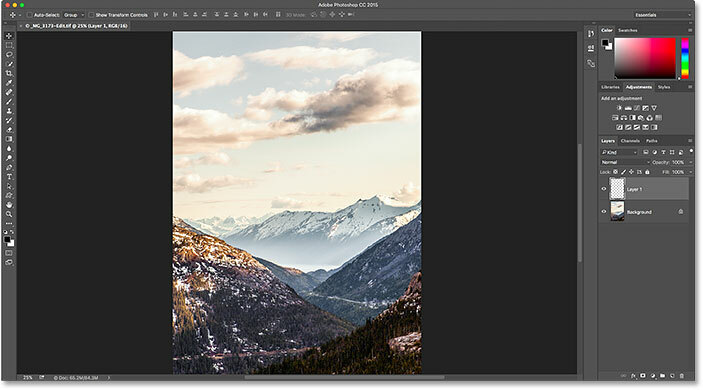 If you've been following along from the beginning, we've now covered all the ways to open images into Photoshop! But while opening images is important, so is knowing how to close them. In the next lesson in this chapter, you'll learn how to close an image in Photoshop, including how to close multiple images at once!